We present USGS tools, websites, publications, and other resources for monitoring, studying, and communicating flood information. 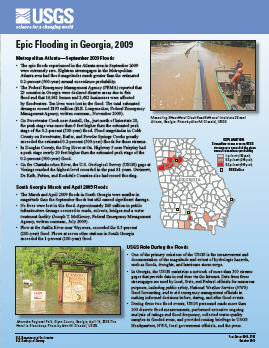 View the South Atlantic WSC topics about floods in Georgia, North Carolina, and South Carolina. The USGS FloodWatch website is a map-based resource from USGS WaterWatch that gives users hourly visual updates for flood conditions at over 3000 locations across the United States. Learn how to use FloodWatch. The USGS Flood Inundation Mapping Program (FIM) partners with local communities and other government agencies to develop and validate flood inundation map libraries. Click the title above to visit the USGS FIM website and learn more about available tools. Completed projects are collected on the USGS National Flood Inundation Mapper, brought to you by the USGS Wisconsin Internet Mapping Group (WiM). Click the image on the left to go straight to the Mapper. The USGS operates an event-based mobile storm-surge sensor network to capture information about coastal and inland storm tides. Click the title above to learn more about the USGS Short-Term Network, or click the image at left to go straight to the USGS Flood Event Viewer. The National Water Information System (NWIS) is the USGS water data portal where you can find a wealth of historic and real-time data related to floods. Click the image at left or the title above to go to the NWIS website where you can query for peak streamflow data by station, State, or region. Or, click here to go to the main NWIS page for a broader range of data. Want to know what's happening right now? Request real-time information from any USGS streamgage with the USGS WaterNow text service. This service responds to your text message with information about the current stage, streamflow, or other parameters collected at the gage. Click the image at left or the title above to learn how. How can a 100-year flood strike twice in 15 years? 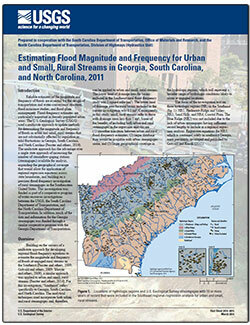 This is a downloadable poster discussing the meaning and use of probability language in flood characterization. The USGS StreamStats website is a GIS-based web tool for estimating streamflows at gaged and ungaged locations. Features similar to the NSS program are presented to users with no programs to install. Users can visit the StreamStats website linked here and click on a stream location on the interactive map to compute estimated streamflows for floods and other statistics. Additional statistics at gaged locations are also presented. 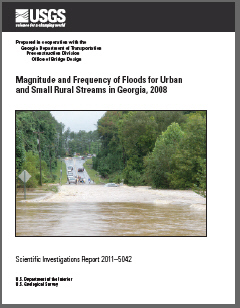 Gotvald, Anthony J.; Knaak, Andrew E.
Magnitude and Frequency of Floods for Urban and Small Rural Streams in Georgia, 2008; 2011; SIR; 2011-5042; Gotvald, Anthony J.; Knaak, Andrew E.
Gotvald, Anthony J.; McCallum, Brian E.
Epic Flooding in Georgia, 2009; 2010; FS; 2010-3107; Gotvald, Anthony J.; McCallum, Brian E.
Data from rain gages that provide real-time data are relayed to the USGS and are transmitted from each station at intervals of 1 to 8 hours. Real-time data available on these web pages are provisional data that have not been reviewed or edited. WaterWatch - View streamflow data using maps, graphs, and tables. WaterWatch is a U.S. Geological Survey Web site that displays maps, graphs, and tables describing real-time, recent, and past streamflow conditions for the United States. The real-time information generally is updated on an hourly basis. Real-time precipitation data is available in our map-driven application for Georgia and North Carolina. You can use a map to select a precipitation-monitoring site and view precipitation amounts for the previous hours and days. A data table shows precipitation at all sites within the state. Precipitation data and related rainfall information, for the South Atlantic Water Science Center geographical region (Georgia, North Carolina, South Carolina).